For nature lovers, who wish to explore the country life and natural beauty of Bhutan, Mongar and Lhuntse are archetypal destinations. Mongar is in the eastern part of Bhutan and this side of the country is quite different from the Western one by the location of towns and cities on the hills whereas the places are located on plain valleys in the West. Mongar stands on a side of a hill and the route from Bumthang to Mongar, crossing the Thrumshing La pass of nearly 4000 metres high, is an unforgettable journey. The route offers breath-taking sights of the Himalayas on one side and beaming flowers, gushing waterfalls and steep cliffs on the other. Besides the natural beauty, the major landmarks include Mongar Dzong which was built to replace the ancient Zhongar Dzong. It is one of the newly built Dzongs of the country. However, it has not departed from the Bhutanese architecture and displays the artefacts of the old Dzong. The annual festival called Tsechu is celebrated here in the months of November and December. Yakang Lhakhang is just a few minutes’ walk from Mongar and great cultural importance is attached to it as it stores sacred spiritual valuables. 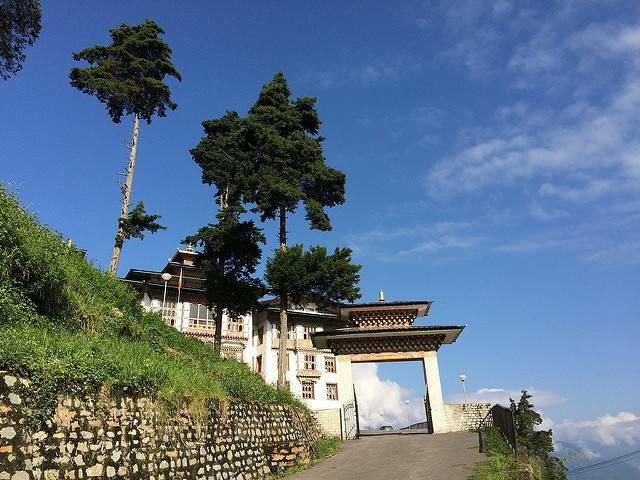 Drametse Lhakhang, often referred to as ‘Peak Without Enemy’, is a prominent monastery of the eastern region. It stands as a religious and cultural centre and hosts yearly festival on the tenth day of Bhutanese calendar. The picturesque Lhuntse, 72 kilometres from Mongar, should be visited as it has sprawling coniferous forests and this place has garnered attention for its unique style of textiles and weavers.